he National Council is involved in: “Theater of War: Soldiers & Citizens Tour.” We are partnering with Outside the Wire, a social impact company that uses theater and a variety of other media to address pressing public health and social issues, on a 2-year grant from the Bristol-Myers Squibb Foundation. 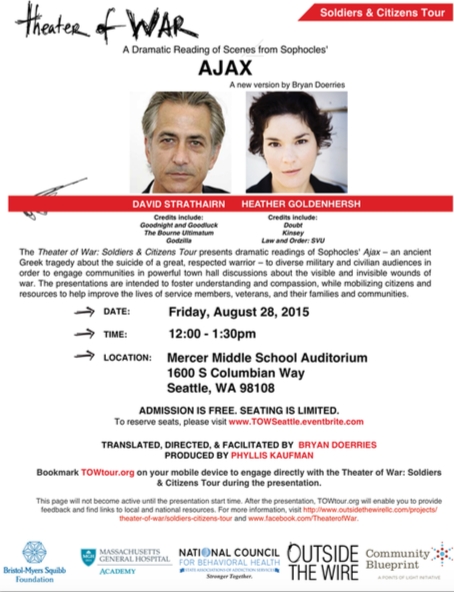 The partnership involves presenting the Theater of War: Soldiers & Citizens Tour to diverse military and civilian audiences to engage communities in powerful town hall discussions about the visible and invisible wounds of war. Each performance includes dramatic readings of Sophocles’ Ajax — an ancient Greek tragedy about the suicide of a great, respected warrior — by professional actors, a panel discussion, and a moderated open discussion with the audience. The presentations are intended to foster understanding and compassion, while mobilizing citizens and resources to help improve the lives of service members, veterans, their families, and communities. The next performances in your area is Friday, August 28 at the Mercer Middle School Auditorium in Seattle from Noon- 1:30 p.m. and the Clover Park Technical College, Building 3 Rotunda in Lakewood from 6 pm to 7:30 pm.